The Estonian World Council’s (EWC)annual meeting will take place in Tallinn from May 3-5, 2018. The first and third day will be devoted to the Council’s general business meeting at the Park In by Radisson Meriton hotel. A seminar and panel open to the public will take place on Friday, May 4, beginning at 10 am, in the Estonian Parliament conference room, thanks to the assistance of Parliament chairman Eiki Nestor. Prior registration is required for admittance, together with one’s identity code or birthdate, to See e-posti aadress on spämmirobotite eest kaitstud. Selle nägemiseks peab su veebilehitsejas olema JavaSkript sisse lülitatud.. The highlight of the Friday seminar is the panel on “Strengthening the ties between the Estonian government and Estonians abroad. Participants include Parliament chairman Eiki Nestor; Anne-Ly Reimaa, Ministry of Culture; Andero Adamson, Ministry of Education and Research(invited); Marianne Mikko, chairman, Parliament Friends of Estonians Abroad Association (invited); Marju Rink-Abel, EWC president, USA; Leelo Pukk, EWC vice-president, Sweden; Marcus Kolga, EWC Vice-president, Canada; and Sirle Sööt, EWC representative, Sweden, and ESTO2019 committee chair. The moderator is Aho Rebas, Sweden. One of EWC’s goals is better to introduce the activities of Estonians abroad and to establish channels in Estonia. That was the topic of discussion on February 27, 2018, when EWC president Marju Rink-Abel met with Parliament chairman Eiki Nestor. Encouraging news is that in April the Friends of Estonians Abroad Association was formed in the Estonian parliament. The elected chairman is Marianne Mikko and vice-chair is Krista Aru. The press release announcing the formation of the association quotes Mikko as saying that „many of our compatriots live outside of Estonia. It is important that Estonians around the world feel a connection to their dear Estonia, as well as support for the homeland. We will try to be a beneficial bridge between Estonians at home and abroad.“ Other members of the association include Monika Haukanõmm, Helmen Kütt, Inara Luigas, Jaanus Marrandi, Enn Meri, Aadu Must, Keit Pentus-Rosimannus and Tanel Talve. EWC was founded in 1954 in the United States, to join together Estonian communities worldwide and to help coordinate their activities for gaining Estonian re-independence. Three major umbrella organizations – Estonian American National Council, Estonian Central Council in Canada, and Association of Estonians in Sweden – were the founding members of EWC. 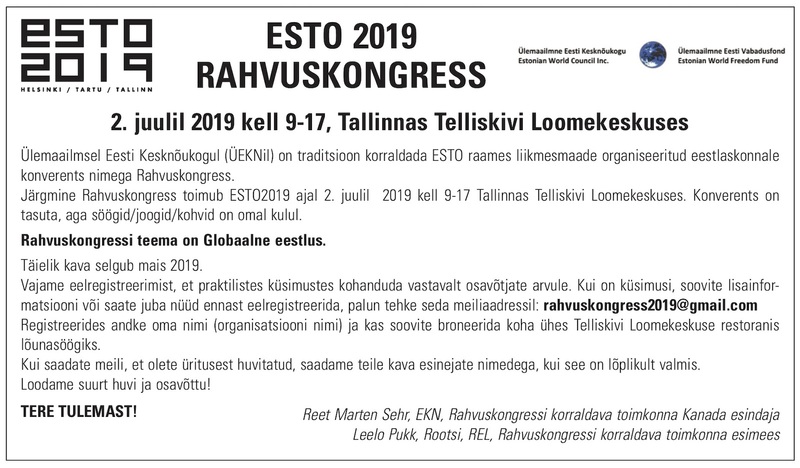 Members today also include Council of Estonian Societies in Australia, Estonian Community in Germany, Association of Estonians in Great Britain, Latvian Estonian Society, Estonian Community in Lithuania, Czech-Estonian Club, Ukrainian Estonian Society, Russian Association of Estonian Societies, and Finnish Estonian Association.